Deep within the brain we have an area known as the Hypothalamus, its the home of our moods and emotions and a very primitive part of the brain. The Hypothalamus is also the area that maintains equilibrium in our bodies and it maintains and regulates every bit of our body's chemistry. It is the area that controls the Endocrine system, it forms part of the Autonomic Nervous System and part of the Limbic System. It is Hypothalmus that is the key to managing stress and all its detrimental effects on our mind and body. It is directly through this area that the holistic therapy Aromatherapy works and is managed by other holistic therapies. Take Cortisone, it has a damaging effect on specialised cells within the dermis (the skin), fibroblasts, these cells produce collagen and elastin, it is collagen and elastin that gives our skin elasticity and support. Adrenalin reduces blood supply to the peripheral tissues, such as the skin and hair, therefore, these structures do not receive adequate nourishment from the blood. 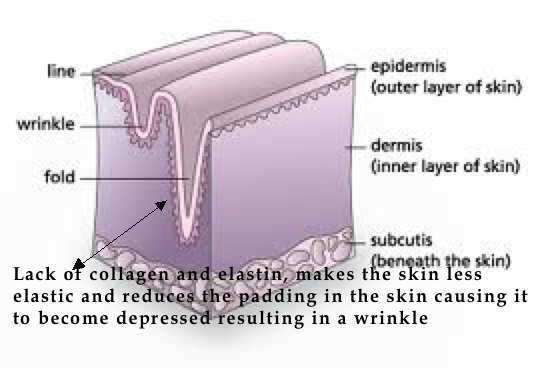 So the effect of long term stress affects the skin resulting in ageing of the skin. We all have various stresses in our lives, we cannot avoid it but we can reduce the effect it has on us with various relaxation techniques such as meditation and other therapies, such as massage, aromatherapy and reflexology or any pastime, even walking, that helps us relax. I hear all the time from clients I haven't the time to have a massage etc but even five minutes of meditation will have beneficial effects on our health in general and not just skin ageing. You can use the most expensive skin creams (not always the best), give up smoking, keep out of the sun but if you're highly stressed and not addressing the situation your skin won't be the best it could be. To be the best we can be, we need to take a holistic approach to our health for our spirit, mind and body all work together so don't neglect any one component of this as each influences the other i.e. a stressed mind is going to affect our physical body and the skin, the body's largest organ is sure to be affected.